The Violin Shop: Magik*Magik Orchestra - Crossover artistry! Ever wondered if you can really make a living being a classically trained violinist, violist, or cellist? These days, there are more opportunities than just soloing or playing in a symphony orchestra. In fact, the members of the Magik*Magik Orchestra have found a way to be successful musicians by thinking outside the box. Minna Choi is the music director of the Magik*Magik Orchestra. Based in San Francisco, she has partnered with John Vanderslice, owner of Tiny Telephone recording studios, since 2008. As the orchestra in residence with Tiny Telephone, they have the opportunity to collaborate and perform on songs and works by musicians who would otherwise have to search for orchestral musicians or, when that proves to be too daunting of a task, to use synthesized sounds (yikes!). In fact, she has been able to both fill a void and create a niche for herself and the classically trained musicians that she works with. 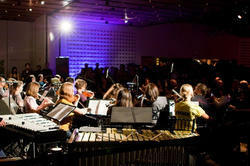 While Magik*Magik is, indeed, a full orchestra (filled with conservatory trained musicians! ), they work as anything from soloists on recordings to the full group. This is such a great way for musicians to be able to work on non-standard repertoire, as well as having the experience of seat-of-your-pants recording sessions. The Magik*Magik Orchestra is really only starting. I expect that we will be hearing much more from them as they continue to create their own magic!